As business owners, we are always solving problems, even if our businesses are growing and improving. Why? Because growth creates new problems. Solving one generation of problems does not mean clear sailing forever. Your solutions only give rise to the next generation of problems. Growing up and maturing as a business does not mean getting past all problems. Growing up means being able to handle bigger and more complex problems. 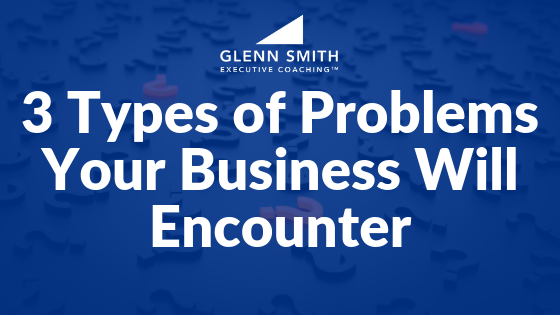 One of the primary reasons business owners hire me as a coach is to help them solve problems. Leadership is all about solving problems! Many business owners are surprised by the new generation of problems that come after solving the last set of problems. However, the best leaders anticipate the next generation of problems. In fact, they create them by growth! They are not surprised when they come, they are ready for them and have planned to overcome them when they arrive. In our Strategic Business Leader groups, we teach our clients that every organization (small business, large business, non-profit, church, etc.) goes through a life-cycle. And every stage of a life-cycle brings with it a new set of problems. Normal Problems. These problems are somewhat unavoidable. They come with healthy growth. The good news is that they are transitional in nature – you encounter them, you solve them, you learn from them, and then you move on. That’s what leaders do! Organizations that suffer from pathological problems do not have time for therapy; they need a turn-around specialist and fast. Normal problems enable us to develop certain capabilities that keep us moving forward in the growth process. Abnormal and pathological problems eventually lead to decline, and worst yet, the closing of a business. There is some good news: Every organization can avert decline through proper leadership. With the right leadership in place, you can anticipate normal problems, and take care of abnormal problems before they turn into pathological problems. What type of problems are you dealing with today? What’s the most appropriate course of action for you to take as a leader? Want some help? Contact us for a FREE 30-minute consultation. 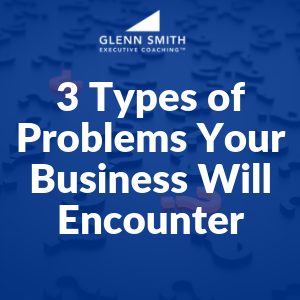 Every business owner needs to be aware of these 3 types of problems. Here you will learn how to recognize them and how to respond to them. Glenn, this is a great way to frame and tackle problems. Thanks for sharing.